You know how exciting it is when a parcel arrives in the post containing something you’ve ordered or asked for, but haven’t actually seen except online? You are really looking forward to opening the parcel and seeing if it is as going to be good as you hope, with just that little bit of worry that it won’t live up to your expectations. And you know how great it feels when it is actually better than you expected? That’s how I felt when my copy of The Magic of Nature Oracle arrived last week. 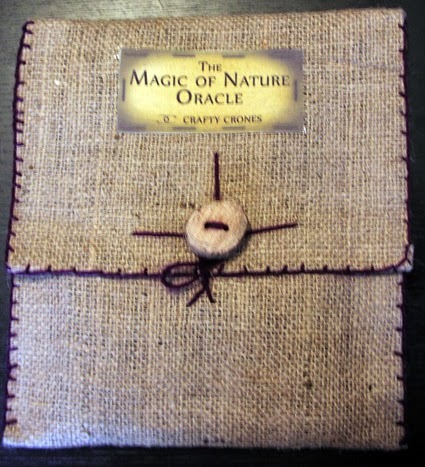 I’d been recommended The Magic of Nature Oracle by a witchy friend who knows the divination cards’ creators, Sheena Cundy and Tania Copsey who go by the name of the Crafty Crones, and that was enough to make me want to review it on my blog, but I didn’t really know what it was going to look like. The first thing that made me go “Wow!” was the unusual bag the divination deck comes in. It is made of natural hessian, blanket stitched with purple wool and finished with a lovely big wooden button. It is just so tactile – much more interesting than a printed cardboard box. Presumably it is more environmentally friendly and longer lasting too. Inside the bag is the deck of 39 cards and a good-sized book giving their meanings and ways to use them. I’ll talk about the cards before I talk about the book, because let’s face it, that’s the most important bit. The images primarily depict animals, birds, insects, trees and the seasons with a kind of luminous vibrancy and sense of motion that makes them seem full of life. Each card gives me a sense of the same feeling I get when I am really out in nature, walking through a meadow of spring flowers or catching sight of a robin or a squirrel on my garden fence just before it flies or bounds off again. And this is English nature too, drawn from the woods, fields, skies and waterways of the Essex countryside where Sheena Cundy and Tania Copsey live. If you don’t know the Essex countryside and think that Essex is all towns housing London’s overspill, think again. Better yet, go and visit the wilds of Essex for yourself. Avoid Lakeside, the M25 and that long road to Southend and you can find countryside as beautiful as anywhere in England. Although by birth I am a Kentish maid myself, rather than an Essex girl, this is still the kind of countryside I know and love – which is probably one of the reasons this deck resonates with me so much. Indeed, common sense advice. The Magic of Nature Oracle, like any oracle set, is a tool to help us see the choices we have, past events that are influencing us and things that have the potential to influence the future. The cards can also be used as an aid to meditation. I love The Magic of Nature Oracle just as much as my witchy friend said I would. If I had to make a suggestion as to how the deck could be improved, it would simply be to add more cards to it. 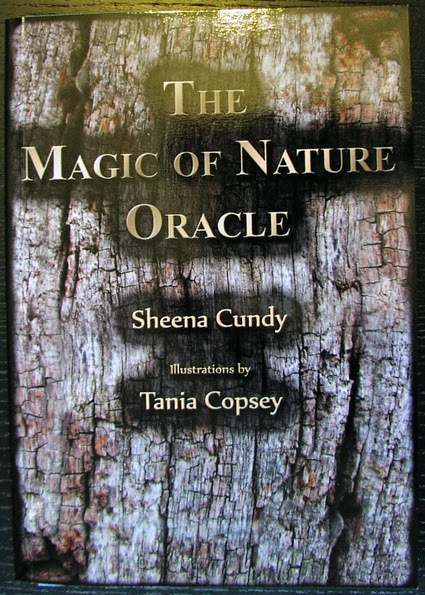 But perhaps some day Sheena and Tania will feel inspired to bring out a Magic of Nature Oracle 2, with more beautiful and inspiring images from the countryside of England. What's up, yes this post is really nice and I have learned lot of things from it concerning blogging.